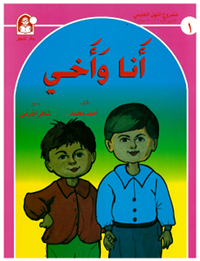 The Al-Manhal publishing house has a large series of books for teaching Standard Arabic to children. The first “set” of books is intended for children 6 to 7 years of age, but some of them are also great beginning books for adult learners of Arabic. On YouTube you can also find videos in which the text is read aloud. Some of the books can be purchased from the Jamalon online bookshop, which is based in Jordan. They’re a bit pricy for books under 20 pages. They’re also hard to locate in the online shop unless you know the title. So, I recommend first look at the title from a downloadable PDF (described below) and then typing in a couple words from the title. Some (perhaps all) of the books can ordered directly from the publisher, Al-Manhal, but their server is often too slow to connect. It appears that the latest edition of books in this series have newly designed book covers with new artwork, so you will need to trust the book title, rather than relying on the book cover looking the same. Individual books from this series can be downloaded from a number of blogs and other websites. One easy site to download them from is this page on the Books To Learn Arabic blog. The 4NewMum.com site also has a page with quite a few of these books, though not all of them, displayed in such a way that you can see the front cover. (I don’t host the books myself because they are copyrighted material.) There is a very cool feature in these PDF files: Within certain PDF viewers (but not all PDF viewers!) you can listen to embedded audio by clicking on the text. Set 1, book 1, أنا وَأَخي, ‘My brother and I’: A very easy book, in which you can learn some vocabulary about one’s morning routine. Set 1, book 2, هَدايا العِيد ‘Holiday gifts’: Learn about what gifts Omar did and didn’t get on the first day of Eid al-Fitr. Set 1, book 3, يَحْيا الْعَدْل, ‘Long live fairness!’: An easy book with color words and dual forms.